This was my second life saver meal last week. I will say this recipe is easier and quicker than the one from yesterday. It really is a throw it all in meal and the cook time is super fast. Pretty much 15 minutes from start to finish. Meanwhile, gently pat shrimp dry with paper towels. Heat a wok or large skillet over high. 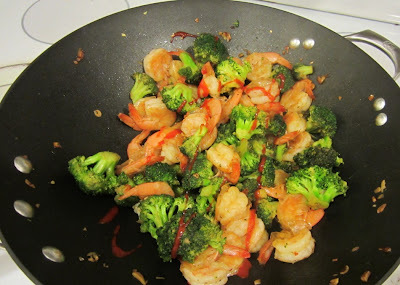 Remove pan from heat and carefully add 2 tablespoons oil and broccoli. Return to heat and cook, undisturbed, until crisp-tender and browned in spots, 1 to 2 minutes. Add 2 tablespoons oil and shrimp and cook, stirring frequently, until shrimp are opaque throughout, about 2 minutes. Remove from heat, add chili-garlic sauce and remaining tablespoon oil, and toss to coat. Stir in 1 to 2 tablespoons water to thin, if necessary. I love a good stir-fry, especially when it involves loads of broccoli! Yummy! My family loves stir fry but our budget doesn’t always allow for the pricier meats and veggies. This is a great alternative. Anyway, I also know a site about stir fry recipe, just Click Here if you want to browse them. Weekend Edition: It's Christmas time in Maine! Weekend Edition: Coming in from California!